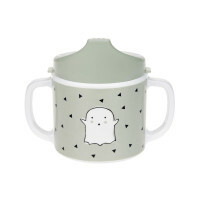 This Little Spookies Olive sippy cup little spookies Peach quickly quenches children's thirst as the handles on each side ensure a secure grip and support while drinking. 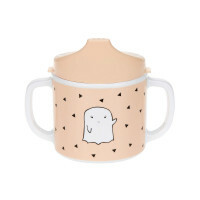 Product information "Sippy Cup Melamin, Little Spookies Peach"
description & equipment This beautiful drinking cup little spookies Peach quickly quenches children's thirst. 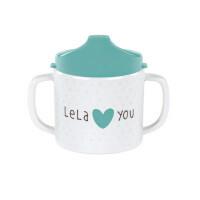 The handles on each side ensure a secure grip and support while drinking and, there is no risk of spillage thanks to the lid with sipping nozzle which is partially available in bright colors to match the cup. 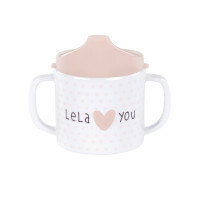 The cups are available with different designs from the babies' and children's collection including Lela. 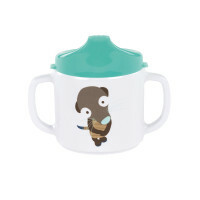 Wildlife, and Little Chums motifs. 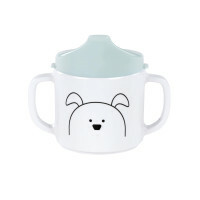 They are included in the dish set without the lid but can also be purchased separately. The melamine cups are dishwasher safe. Recommended for children 6 month and up.